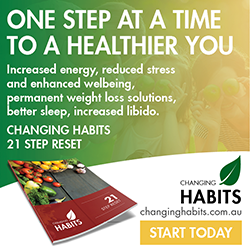 One step at a time to a healthier you. Increased energy, reduced stress and enhanced wellbeing, permanent weight loss solutions, better sleep, increased libido. 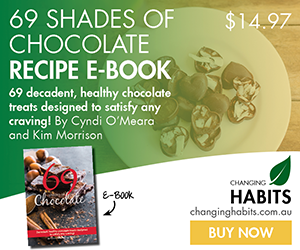 69 decadent, healthy chocolate treats designed to satisfy any craving! By Cyndi O’Meara and Kim Morrison. Loads of gluten free and dairy free recipes to choose from! Support Drops used in conjunction with 4 Phase Fat Elimination Protocol. 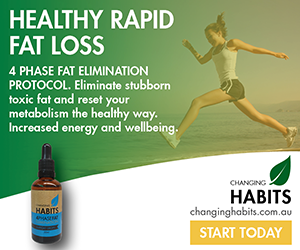 Eliminate stubborn toxic fat and reset your metabolism the healthy way. Increased energy and wellbeing. 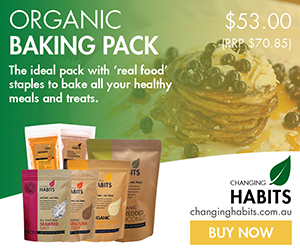 The ideal pack with ‘real food’ staples to bake all your healthy meals and treats. 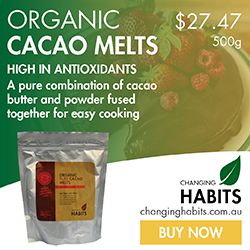 A pure combination of cacao butter and powder fused together for easy cooking. Natural potent source of Vitamin C. From Amazonian berry. Easily digestible. Natural source of curcumin. Great anti-inflammatory properties. Plant-based, rich in minerals and trace elements. Easily absorbed. Real food naturally fermented and dried. Assists in good digestion, easily absorbed. Ethical, sustainable source of essential fatty acids. High in Omega 3, 6 and 9. Excellent alternative to fish oil. Incredible amounts of nutrition in just one spoonful. Easily digested and absorbed. ​​​​​​High in antioxidants. Beautiful aroma and flavour, non-irradiated source. Insoluble fibre, protein and essential fatty acids. Very versatile. Preservative free, delicious and healthy, ideal for cooking.